Some farmers on the Prairies are feeling slightly nervous about their soil moisture so far this year as precipitation in some regions remains below normal. Areas still considered abnormally dry include south of Calgary, stretching east into southern Saskatchewan and west of Winnipeg into the Brandon area, according to Agriculture Canada’s Canadian Drought Monitor. Severe and moderate drought conditions, according to the agency, are within the Regina-to-Saskatoon corridor, the Lethbridge area and southwest of Winnipeg. “I think for mixed farmers and cattle producers, there is a lot of concern,” said Bill Gehl, who farms near Regina and is a director with the Saskatchewan Wheat Development Commission. 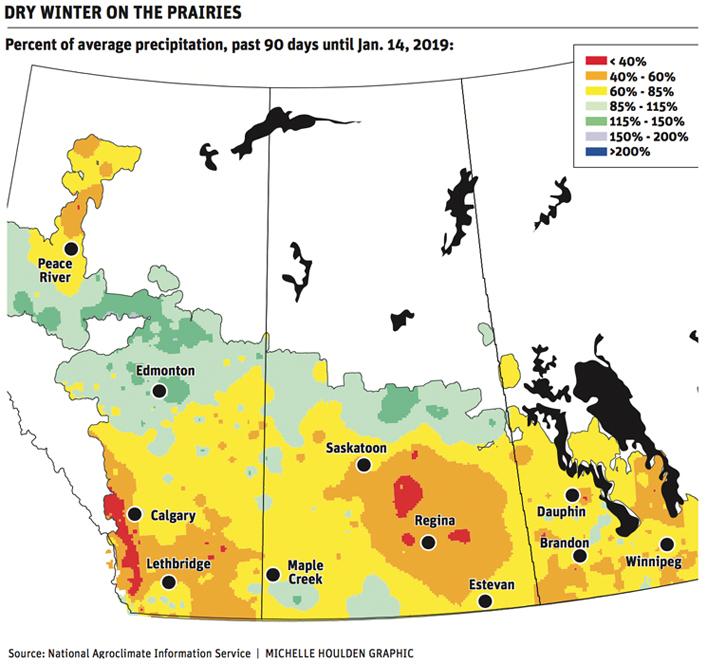 Trevor Hadwen, an agroclimate specialist with Agriculture Canada, said soil moisture and snow pack are becoming more of a concern because there hasn’t been significant snow in many parts of the southern Prairies this winter. For the regions that received average to below average precipitation, he said it wasn’t enough to replenish losses that occurred last summer. “The two areas that continue to be the biggest concerns are east-central Saskatchewan and southern Alberta,” he said. Fred Lozeman, a producer near Cardston, Alta., and a director with Alberta Beef Producers, said conditions have been dry in his area. He said while no snow cover gives cattle good access to the grass, there are worries there won’t be enough moisture during the growing season to replenish the land. “It’s not all doom and gloom, but there is a nervousness, an apprehension,” he said. While southern Alberta has had snow, Hadwen said much of it has melted. He said the region has roughly 20 to 30 millimetres less moisture than it normally does, though there is still lots of time to make up that deficit. As for Manitoba, Hadwen said the southern region has received below average snowfall this winter, although precipitation this fall has improved conditions. He said more snow in southern Manitoba will be needed before spring so the soil can be replenished. “Everyone is getting kind of nervous, for sure,” said Fred Greig, who farms near Reston, Man., and is chair of the Manitoba Wheat and Barley Growers Association. Hadwen said regions that appear to be doing well for moisture so far include the Shaunavon, Assiniboia and Swift Current areas in Saskatchewan. The Prince Albert and North Battleford areas are also seeing near or above normal precipitation with some instances of moderately or very high levels. As well, the Edmonton, Red Deer and Peace regions in Alberta have seen either near or above normal precipitation so far this winter.